Critters, Creatures, & Denizens was written by J.A. Rhodes-Gloor and published by Cognition Pressworks. This product was Updated in 2015 with a Revised Edition (released in 2016). As both editions are from the same publisher, this entry covers the Revised Edition. If you have the earlier version, this new edition "[f]ixes issues with first edit, plus [includes] 30 pages of new monsters, new mutations, two new character races, and more." In the forward, the author calls out a change to creature's Luck stats so that they are consistent with how Luck is used for PCs. This is a big book. The pdf clocks in at 299 pages, and while that includes things like covers, table of contents, and OGL, there is still a considerable amount of meat to this book. Importantly for those who might wish to publish their own Dungeon Crawl Classics products, there is a generous free licensing agreement, modeled after that from Angels, Daemons, and Beings Between, to use material from this book. Disclosure: I suggested this licensing to the author in order to increase the utility of the work. There is a lot of material to cover, so you will understand if I can only hit the highlights. The book is divided into four broad chapters, which I will use to discuss the material therein. This chapter describes the basic rules of how the book is intended to be used, and how creature entries are intended to be read. Immediately, and perhaps somewhat pedantically, I am struck by the use of the term "Storyteller" instead of "judge". This doesn't affect the utility of the product at all. You may wish to ignore it. You may not care. There is a table for Creature Ability Scores from 1 to 20. That is actually pretty useful. When the author discusses ability scores for creatures, he considers how they might differ for creatures (as opposed to PCs). For example, the Strength of non-humanoids is considered based upon how much the creature can bring to bear on a physical attack. Stamina and size can be used to gauge weight. I am not an advocate of the type of monster-building exemplified by games like 3rd Edition Dungeons & Dragons or Pathfinder, although I can see the potential utility of this information...particularly when hit Chapter 4 and are turning monsters from those games into monster for Dungeon Crawl Classics. In fact, the author considers a lot of material that might never be used by the average DCC judge, but you might wish to have nonetheless. Size and reach receive exhaustive coverage. Action Dice are considered based on size and diet. What a creature can lift and carry is considered in detail. Movement receives just over eight pages, but that also includes a discussion of terrain which is interesting in its own right. For some reason, saving throws are called "saving rolls" and Action Dice are called "Attack Dice". Again, this is a niggling concern for the utility of the book, but it breaks up the flow when I read it. This chapter describes a number of special attacks, discusses "Critters with Class levels", adds "Mighty Deeds of Action" (which are already implied in some Dungeon Crawl Classics adventures, where a Deed Die can explicitly be added to a non-combat roll), elemental affinities, and a new version of the find familiar spell. This version of the spell allows the caster to attempt to gain any type of creature as a familiar, rather than relying on the randomized tables in the Dungeon Crawl Classics core rules (and expanded on in Crawl #3). To say that this work is meticulous is something of an understatement. The author now considers mutations, with two sets of mutation tables. "The Basic table has 29 mutations and one entry that either causes multiple rolls on the standard chart, or allows access to the Enhanced mutation table. Basic mutations might grant the critter or character a boon, or an interesting ability; but most of the time mutations are a hindrance or nuisance for the Character. Roll 1d30 modified by Luck to determine result. "The Enhanced table lists the 16 enhanced mutations. Most of these will grant the critter or creature powerful and useful abilities, but at a terrible cost. These mutations are fueled by burning off the character or creature’s physical abilities. These burned points heal in the normal fashion for spellburn. It is up to the Storyteller whether or not these powerful mutations will be allowed within the game milieu. Roll 1d16 modified by Luck to determine the results." If your thoughts immediately turned to Mutant Crawl Classics or Crawling Under a Broken Moon, you are not alone. However, the author also gives a list of causes for mutation that have noting to do with hard radiation under a uranium-soaked sky. The Robert E. Howard quote that heads the chapter, from Queen of the Black Coast, is also a reminder that mutations belong in settings other than post-Apocalyptic ones. In addition to the mutations themselves, the author considers removing mutations, whether or not dead creatures can have mutations, and (critically) how much is too much. He also discusses a "Revenge from the grave" option which is sure to see use in some campaigns. Both basic and enhanced mutations are fully described, with the same meticulous attention to detail which was displayed in Chapter 1. Indeed, there is more information than you probably need, leading this section to be equally useful to the prospective Game Master of any version of Dungeons & Dragons or Pathfinder. The information you need to use the material with your system of choice is almost certainly there. Finally, the Snorvolumph, a huge mutated frog, is given as an example of how the mutation system works. This book does not use standard Dungeon Crawl Classics statblocks - there is a lot of extra information. I consider this a flaw, but if you are considering using the book with another system, or looking at it as a conversion guide, it may well be a strength. And, of course, you may not care either way. Regardless, you get a metric tonne of creatures. I am not going to count them all, or list them all. The description on RPGNow says "120 Pre-generated DCC RPG compatible creature entries from the banal to the horrific with more than 400 variations for size and other subtypes." That's a lot of critters. Some of the creatures are rather mundane. Do you need stats for a dog, a goat, or a cow? You might, if your 0-level PCs start with these creatures. Do you need statistics for doves? Probably not, but if you do, they are available. This chapter also has statistics for many more esoteric creatures, both fantasy gaming staples and creatures that are, as far as I can tell, unique to this work. There is a considerable discussion of Angels, Demons, Devils, and Faeries, including a critical table for Faerie beings (which I recommended using in both Creeping Beauties of the Wood and would similarly recommend using for adventures like The Revelation of Mulmo). There is also a critical table for Devils. There are two full patrons described in this chapter, Krelvax the Weaver and the Gear Lord, as well as two unique character classes: The Ixi are an intelligent insect evolved from ants, and the Jaguar-kin are humanoid-feline hybrids. There is a good discussion of snake venom and spider webs. If you intend to use giant insects in your campaign milieu, you have a full selection to choose from. The entry for chickens include large riding and war chickens. If you are familiar with Hans My Hedgehog this should spark some ideas. And, really, is this so much sillier than Michael Moorcock having characters use flamingos as mounts? Hobs. Not because your PCs will probably ever fight them, but because they belong in rural kitchens and perhaps wizards' towers. The idea of hearth spirits that might take vengeance on you if you violate the laws of hospitality - which is not how these are portrayed, but the crafty judge is, well, crafty - can keep even powerful PCs up at night. Or just not slaughtering peasants for the hell of it. Moose. Because I live in Canada. And because I have read Hiero's Journey. Mules. Your PCs are, sooner or later, going to need them. Ancient spirits. More powerful than ghosts, and less powerful than patrons, these are creatures with a lot of potential. PCs may seek out ancient spirits with lost knowledge, but just knowing that a creature like this might haunt an old barrow or a ring of standing stones offers cool flavor. 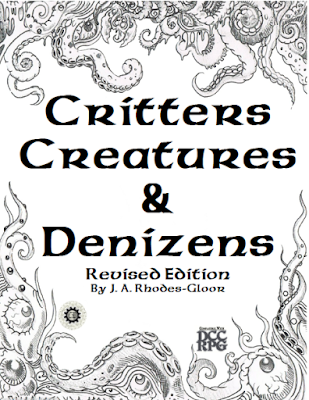 Dungeon Crawl Classics uses the mantra of "Make Monsters Mysterious", and the Critters, Creatures, & Denizens book does offer a lot of options for creatures, including additional ways to modify un-dead, as well as variants of creatures. The book packs a lot of monsters, and a lot of options. Finally, the author discusses converting creatures from other systems, both when you know the creature's compatible ability scores from the other system and when you do not (to wit, newer editions and older editions of a certain role-playing game). Tables are reprinted in a tidy place, as well as a worksheet, which you could print out to help you devise new creatures. The DCC Trove of Treasures is an attempt to discuss every Dungeon Crawl Classics product out there. By necessity, this gives these entries something of the nature of reviews. If you use them that way, I hope that they have helped. Please keep in mind, though, that I can't talk about every product without talking about my own as well. My experiences, and my preferences, need to be taken with a grain...nay, a bag...of salt. This is not a resource I have used a great deal of, or, at least it was not before I began prepping Toronto Crawl Classics. Critical Table F is fun, and when one PC was turned into a raccoon by a lucky faerie attack, it was very useful to have statistics to hand. Despite the things that I mentioned as bothering me above, I didn't hesitate to purchase the revised edition in print. Sounds like it might be time time to check this out. Does the cover have Rvised Edition? Is that intentional or have a meaning? I snagged the image from RPG Now. My actual print copy says "Revised" instead of "Rvised". I think they revised it before it was actually printed. When I get a chance, I'll make a new graphic from my pdf copy, if the permissions will allow me to.